While you’re prepping your home and wardrobe for the transition into fall, don’t forget about tweaking your brunch menu. Yes, that means pumpkin spice lattes will have to share space at the table because caramel apple mimosas are here and they’re bound to become your new favorite fall drink. Spotted at Delish, the delectable drink sounds like the perfect excuse to get your late-morning buzz on (responsibly, of course). The next time the squad hits you up with a “let’s do brunch” text, you can totally surprise them by whipping up a round of these caramel-icious mimosas. We know — the cooler weather and cloudy skies make us even lazier than normal, but luckily these tasty autumnal beverages are pretty simple to prepare. You start off by dipping champagne flutes in caramel and cinnamon sugar. Before you launch into a sugar-induced fit and lick the rim, fill the glasses with apple cider, salted caramel vodka and champagne. Add an apple slice to make it look all cute and then proceed to drink the entire batch because OMG LOOK AT THEM. Aaand yep…we’re still drooling. 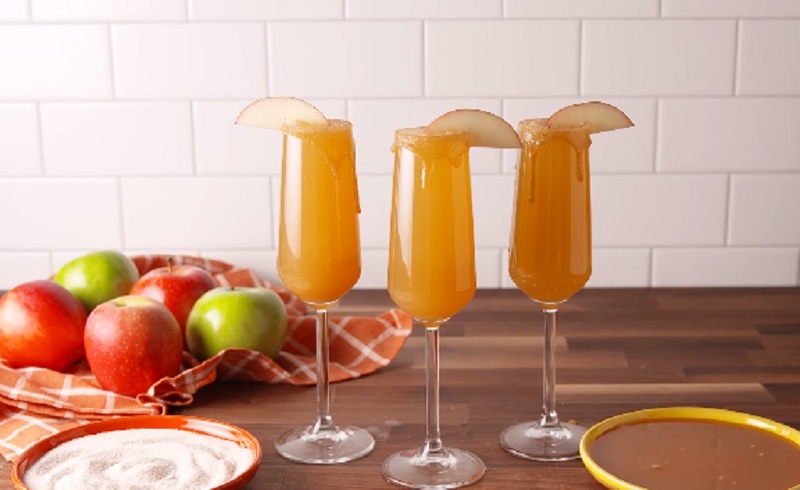 Caramel apple mimosas are officially on our Thanksgiving Day menu.